Preheat the oven to 350°F. Heat the grill pan on the stove top over medium-high heat. Bring a pot of lightly salted water to a boil, add the pasta, and cook to al dente, about 7 to 9 minutes. Drain the pasta. Clean the chicken and slice lengthwise into ½-inch-wide stripes. In a mixing bowl, toss the chicken with 1 tablespoon of garlic, 2tablespoons of the olive oil, and salt and pepper. Grill the chicken for 2 to 3 minutes on each side, then place it on a sheet pan and bake it in the oven for 5 to 7 minutes. Remove the chicken from the oven, let cool, then cut it into smaller strips, about 1-inch long. In a large sauté pan over medium-high heat, heat the remaining olive oil and sauté the eggplant until cooked through, about 8 to 10 minutes. Add the cream, pasta, parmesan, chicken, the remaining garlic, and mix well. Add the tomato sauce and spinach. Allow to heat through and serve. 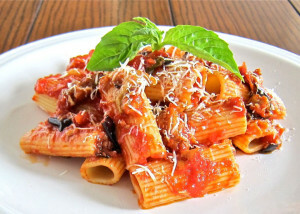 ** Tip ** : Rigatoni is served here with chicken in a pink eggplant sauce. The dish is rich with an almost meaty flavor and texture even without the chicken, which can easily be omitted for a vegetarian version.